Enjoy a relaxing day out exploring Gondwana Rainforest in the World Heritage Listed Dorrigo National Park, picturesque waterfalls, scenic lookouts, Bellingen township and wine tasting at the award winning Raleigh Winery. Our friendly guides will pick you up from your accommodation and we will wind our way up the scenic Waterfall Way. Enjoy morning tea at the picturesque Dangar Falls before entering Dorrigo National Park - Gondwana Rainforests - World Heritage Area. With over 150 species of birdlife, the elevated Walk with the Birds boardwalk offers you unique and up-close birdwatching opportunities as you make your way to the breathtaking views from the SkyWalk Lookout. Relax and let our guides prepare you a delicious, healthy lunch at one of our tranquil locations. Take in the serenity as we wind our way back down Waterfall Way to the township of Bellingen, where you will have the opportunity to explore the many boutiques and cafes. Next we head to the award winning Raleigh Winery*, where you can taste unique boutique wines, fortified wines and the famous brandy creme liqueurs as you soak in the views of the beautiful Bellinger River. *Subject to winery opening hours. Not available Mondays or Tuesdays outside of NSW School Holidays. Winery hours may change without notice. Join us for an action packed day full of waterfalls, rainforest, kayaking, stand up paddle boarding and zorb soccer. Includes lunch and dinner! Make the most of this introductory price while it lasts. Our friendly guides will pick you up from your accommodation and we will wind our way up the scenic Waterfall Way to the majestic Dangar Falls. 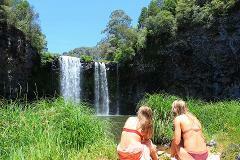 Enjoy a complimentary lunch and a swim at this tranquil location before entering Dorrigo National Park - World Heritage Area. Hike through the Gondwana Rainforest and experience the spectacular view from behind Crystal Shower Falls. From the SkyWalk Lookout you will enjoy breathtaking views over the canopy all the way to the coast. Next stop, sunny Sawtell! What better way to end the day than with a gentle paddle on a kayak or paddle board to our sunset dinner location where you can get your adrenaline pumping and laugh like never before - bouncing, crashing and tumbling in the crazy game of zorb soccer while we prepare you a BBQ dinner before dropping you back to your accommodation. Experience the best of what the Coffs Coast has to offer with spectaular lookouts, incredible wildlife, fascinating villages and wine tasting. Explore the coastal highlights of the Coffs Coast on this wonderful day tour. Enjoy spectacular views across the Pacific Ocean where the rainforest truly meets the sea! Stroll along the Solitary Islands Coastal Walk, with beautiful waterways, pounding surf, and a climate that some describe as the best in the world. Explore the beach-side villages of Urunga and Sawtell, with their variety of eateries, specialty shops and galleries that reflect the character and talents of this fascinating community. 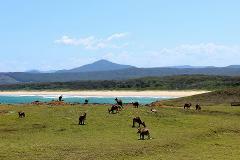 At Emerald Beach, spend some time spotting some wildlife and enjoy the views from numerous headlands and look outs. Enjoy a drive through the countryside before tasting some local produce at Two Tails Winery* and returning to the sea-breezes of Coffs Harbour. *Wine tasting subject to winery opening hours. Not available Mondays or Tuesdays. Winery hours may change without notice.